This post was originally published on Borough Market’s website. Head there for daily updated articles and recipes. Perhaps you saw last week’s announcement that there will be a Borough Market Cookbook published in the autumn. If not, it is happening — The Borough Market Cookbook: Recipes and Stories from a year a the Market will be published on 4 October. These things are never the work of just one person, and indeed many people are involved in the making of this one (the process is ongoing …), however I was thrilled to be asked to pen much of it, and to come up with a set of recipes that showcase and utilise the produce available at Borough Market, and indeed other produce-led markets and shops. No doubt most food writers (and home cooks) would consider compiling a cookbook for Borough Market a dream job — just think of all the potential material! — and indeed as someone whose written and created recipes for the Market since 2012, I was acutely aware of how rewarding and tasty the process would be well before getting going. We chose, in the end, to create a recipe-led book based on a year of market shopping. The book focusses on the four classic periods of a calendar year, with each section offering a set of dishes based on ingredients at their peak at that time, organised according to appetite — from breakfast through to baking, desserts and after dinner drinks. There are minimal effort, mid-week dishes for two or four people; easy, one pot family bakes; and more celebratory and involved feasting items too. Some recipes feature ‘hero’ Market products, others are inspired by specific traders or the foods they offer, though all could still be cooked even if you can’t make it to SE1 that week. The recipes are eclectic and a mix of classic and contemporary, but all are united by the fact that all of them celebrate and utilise the kind of ingredients that Borough Market specialises in: the seasonal, sustainable, slow, and sustaining. Interspersed among the recipes are profiles of Borough Market’s traders, and essays about events, typical Market scenes and on the ethics of eating in the twenty-first century. But primarily it’s a cookbook based on seasonal market shopping and eating. We hope it will inspire and inform people who want to cook from scratch, to shop and cook smartly, and to enjoy food — so that they can take advantage of the produce on offer at Borough Market, and other markets like it. Each month from now to October, I will write a post hinting at the kind of recipes and themes you can expect from the book — some, like this one, will focus firmly on seasonal market shopping and cooking, while others will also highlight Borough’s traders, key Market events, values and other stories similar to those in the book. This wild garlic, tarragon, pistachio and purple sprouting broccoli pesto dish illustrates the style of thinking, shopping and cooking behind the recipes in the book: it’s based on seasonal items, has an ingredient list that can be fulfilled at Borough Market, involved conversations with traders as I gathered inspiration and collected the components, and was ultimately easy to put together and delicious to eat. Walking around Borough in mid-March and April you can’t fail to be drawn towards the baskets and bags of springtime ingredients, like purple sprouting broccoli and wild garlic — spring’s is a new shade of green, brighter and somehow more sparky than the dark greens, purple and brown palette of winter. Fairly quickly I fell on the plan to turn a large bag of wild garlic from Ted’s Veg into a pesto to stir through pasta; though it would be bolstered by some of the purple sprouting broccoli and some tarragon too, as I personally find pastes that only use wild garlic a little harsh. Next stop was Gastronomica for dried pasta (though the fresh stuff from La Tua would’ve worked just as well). Of course any shape would be fine, but I’ve a particularly strong affinity with conchiglie at the moment, plus I knew the insides of the shell-shaped pieces would conveniently gather and hold puddles of pesto and purple sprouting florets. After that, to Oliveology for some pre-shelled pistachio kernels, an alternative to the more traditional pine nut, which will lend sweet notes and yet another hint of bright green to my paste. And finally a few paces across Three Crown Square to Bianca e Mora, where I had an interesting chat about the two Parmesan cheeses they currently stock — an organic one made from Fresian milk, and an intensely more-ish variety made from the milk of the ‘red’ cows of Emilia Romagna— and another they’re awaiting from next week, which uses the milk of a particularly rare ‘white’ cow, and is only made by just two producers. Barely ten minutes of very enjoyable shopping, and about the same time in the kitchen, to create something seasonal and fulfilling in every sense of the word. Here’s a twist on a classic basil-based pesto that takes just a few minutes to put together; and as such is neatly suited to an evening supper or weekend lunch. It’s great stirred through any pasta shape (obviously), but those interesting shapes that hold a little sauce in their characterful indents are particularly good. You could also leftovers to dress recently-boiled new potatoes, coat salmon fillets before grilling, or many of the other ways you might use pesto normally — just so long as that includes some heat, as the wild garlic makes this overly feisty if completely raw. Using purple sprouting broccoli stems adds bulk to the paste, which ensures all pieces of pasta will be generously lubricated. Put a kettle on to boil. Cut the woody ends from the base of each broccoli stem and discard. Trim the leaves and the florets from the stems and set to one side. Weigh 100g of stems and place in a heatproof bowl, and add any remaining stems to the leaves and florets. Pour the just boiled water over the stems and leave for 3 minutes before draining through a colander and refreshing under cold water until cool. 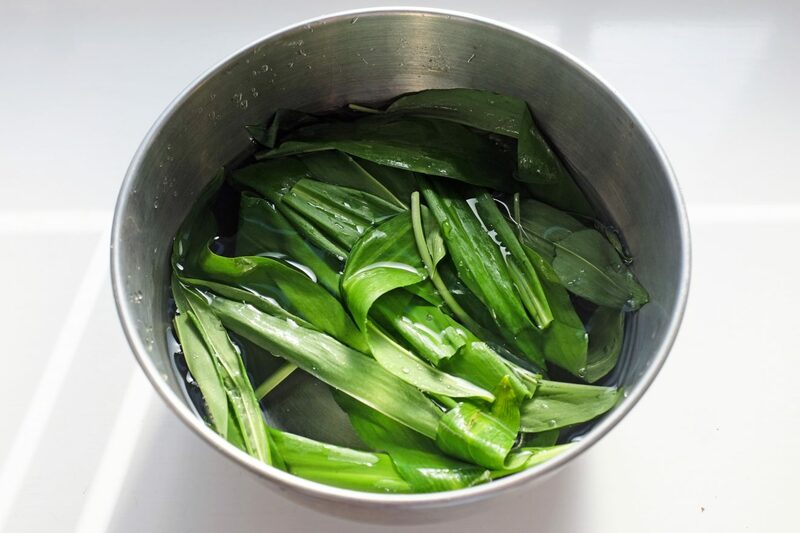 Strip the leaves from the tarragon, discarding the stalks unless soft, then roughly chop the wild garlic and place both in a blender or food processor. Add the Parmesan, pistachios, lemon zest and juice and olive oil, then the cold purple sprouting broccoli stems. Pulse then blend until relatively smooth. Add flaked sea salt and black pepper to taste, pulse once more, then decant into a tupperware or other sealable container. Store until required, topping with additional extra virgin olive oil if you don’t plan on using within a few hours. When ready to eat, bring a large pan of heavily salted water to the boil, dropping in the pasta only when the water is fully rolling and bubbling. Cook to the the time suggested on the packet, adding the purple sprouting broccoli florets and leaves (and additional stems if you have them) with 90 seconds to go. Drain through a colander, saving 2 tablespoons of cooking water. Put half the pesto in the base of the now drained saucepan (or a separate mixing bowl). Decant the pasta and broccoli from colander to the saucepan (or bowl), add the remaining pesto and cooking water. Gently toss and stir until the pesto is well mixed, then leave for 1-2 minutes for the residual heat of the pasta to temper the garlic a little. Serve, with extra Parmesan on top if you wish.